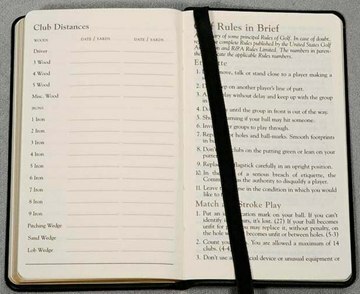 Personalized Golf Rules Book Custom Printed or Debossed in Bulk. Promotional. Genuine Leather Covers. Our golf rules book is elegantly covered in premium genuine leather. It is an indispensable reference book that makes a wonderful gift for any golfer, from novice to expert! Free artwork design. Budget Prices for USA, Canada for personalized golf rules books. American clients pay no taxes. Prices below include your custom debossing or your 1-color custom imprint (Gold Foil is recomended). 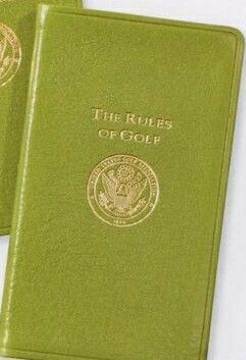 We also supply blank (not custom imprinted) golf rules books: contact us about pricing. Setup: $65.00 per order, for either debossing or imprint. Production Time : 7-10 days after art approval; contact us for faster delivery. This compact score book records up to 56 rounds and notes on your play. It includes the United States Golf Association's Rules of Golf in Brief. Fits neatly in pocket or golf bag. An ideal gift for any golfer.